Julie Hecht (keep up with her blogs in Scientific American) has a new article about dogs following pointing gestures in Bark Magazine that not only adds to our understanding of the evolution of the domestic dog, but also points out (sorry, but really, who could resist?) the importance of both ‘nature’ AND ‘nurture’ in communication between people and dogs. You may recall an article I wrote in 2010 about this issue, (Do Dogs Inherently Understand Pointing Gestures? 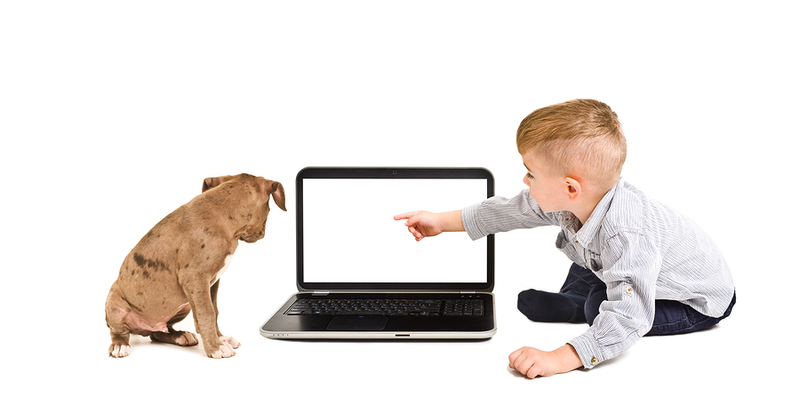 ), questioning the statements of researchers Hare and Tomasello who argued that even young puppies inherently understand the meaning of a pointing gesture. My experience suggested the opposite: When I extended an arm and finger in one direction, young puppies would sniff my hand and lick my fingers. Not exactly what I was trying to communicate. However, the researchers found that while chimpanzees and wolves were unable to follow pointing gestures, even very young dogs could. Thus, they concluded that the ability to follow a pointing gesture must be genetically mediated, and have been selected for as part of the evolution of the domestic dog. In other words: Nature (genetics) prevails. As is often the case in science, another researcher, Monique Udell, followed up on this issue and had different results than that of Hare and others. She found that wolves did relatively well, while shelter dogs performed poorly. At this point (ah, there’s that word again! ), things felt a tad, uh, murky. The research appeared to be contradictory. Words were said about the validity of methodologies. But here’s the beauty of the scientific method, and of importance of combining anecdotes and good, solid science: Other researchers jumped in, and because of their efforts, the mystery is closer to being solved. Basically, everyone was right. (How often can you say that?) Studies by Miklósi and others show that domestic dogs have a predisposition to attend to human gestures. Márta Gácsi and colleagues found that dogs bred to work as a team with people did better on pointing tests than guarding breeds. Dogs attend more to the pointing gestures of familiar people than non-familiar, and the environment has a significant effect (home versus laboratory for example) on the results.. It even turns out that children do not “inherently follow a pointing gesture” (as assumed in some studies on canids); they don’t follow a point until about six months of age, and began to do it themselves when they are a year old. In other words, there are many factors that influence a dog’s ability to understand the meaning of an extended arm, and nature (genetics) AND nurture (learning) work together to create an individual who knows to follow your finger to find the treat you dropped on the floor. Why care? Ms. Hecht stated it best: “Here’s why we care: this one little gesture, in all its complexity, could be a core feature of the intimate bond we share with dogs.” Issue such as these are helping us to understand what makes a dog a dog? I’ve called our relationship with dogs “nothing less than a biological miracle,” and argued for years that it deserved more attention from a variety of fields, including genetics, anthropology and psychology. Now it’s getting it’s getting the academic interest that it deserves, and it’s a wonderful thing. At the moment, it looks as though a dog’s predisposition to attend to us is genetically endowed, which creates an opportunity during development for the dog to learn all kinds of things that make them especially good at hanging out with us. Cool. Watch this space… more wonderful research no doubt yet to come. But there’s another reason I’m writing today about this issue–it seems that many people haven’t quite gotten over the “nature versus nurture” arguments of decades ago, and are still resistant to accepting that most complex behaviors are the result of an integration of genetics and the environment. However, the times they are a’changing, especially given the knowledge about epigenetics that is turning our perspective upside down. One’s genetic code not only influences one’s development, but the same process works in reverse. Genes can be switched on or off by the environment–and relatively minor changes can have significant effects. Thus “identical twins,” with the exact same set of genes may look alike (or not), but often behave differently. No wonder people are often disappointed in efforts to clone their dogs and cats. I thought about all this last night while I was snuggled against Willie, stroking my hand up and down the soft fur of his belly. What kind of interplay went on between his genes and his early development to make Willie Willie? He hummed a little in response, and tucked his head into the crook of my neck. I don’t think he cared much about the answer. Which begins another line of inquiry, about the mental lives of dogs compared to ours. Ah, so much to think about. Or not, which is one of the reasons we love our dogs so much–because they turn off our monkey minds and help us enjoy the moment. But while your mind is set onto “on,” do you point to communicate with your dog? The BC’s learn early on that pointing means “run up the hill,” or “race to the barn.” I haven’t used it as much with Tootsie, I think I’ll experiment tonight and see how she does. You and your dogs? MEANWHILE, back on the farm: Hot. Humid. Not my favorite weather. But all the animals are healthy, the third round of flowers are starting to bloom, and Jim is building us a deck under a shady ash tree, so it’s all good. Maggie surprised me this morning when I asked her to move two lambs back into the barn. They were by themselves in the woods, bawling for their momma, and when I sent Maggie to round them up she pretended that they weren’t there. I wish I had a video of it, it was comical to watch Maggie do a short outrun, get right behind the lambs and then look around, left and right… No sheep here! I realized she’d never worked lambs without their mothers before. The lambs are about 2 months old, weigh about 45 pounds and are a far cry from a 120-150 pound ewe. I am sure she knew what I expected, but was nervous about dealing with such an unfamiliar situation. Lambs can actually be very hard to work, but I knew that these two would run right where I wanted them with the slightest encouragement. Sure enough, once Maggie accepted that yes, she really did need to work the lambs, she put her head down, walked forward a few steps and the lambs ran out of the woods into the barn. A good lesson for the Divine Miss M.
Tootsie thinks the Find It game is the best thing that ever happened to her. I switched to cooked chicken, because the smell is stronger than kibble, but she still can’t use her eyes to find it because it looks so much like gravel. Toots is learning that looking at me won’t get her any information, and is starting to use her nose more and more. Great fun for us both. Between playing with the dogs and watching the U.S. Open (yay Dustin! ), I spent a lot of time in the garden. 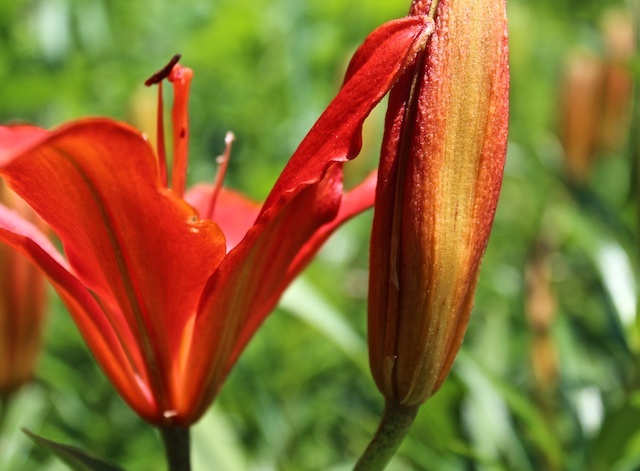 Here are the first lilies in the garden; such a deep, rich orange. Love ’em. I have a little puppy mill survivor, mostly poodle, and I use hand/pointing gestures a lot. I point for her to go inside, she had a tendency to want to go the other way, I point to go up the steps at bedtime. I find it very helpful with a little dog I’m still working on making her feel safe. When we first got our Labrador Retriever puppy and began to walk him, as we got to a corner I just naturally pointed the direction we would take — left, right, straight. No conscious intent to this on my part, I was talking with him too in order to maintain awareness contact. And over time he really got the idea and would look up to me on hearing his name to see which direction we’d go. As he reached age 2 to 3 and became a more purposeful hunting dog, I was surprised to find that this awareness of pointing meaning something had translated to field work. When he lost the scent of a bird he was tracking he would look to me and I could direct him left, right or away with hand signals, just like magic! Of course it helped a lot when the first couple of times I did this he actually found the bird. This, of course, put pressure on me to be *always* right so he’d keep paying attention and impressing my friends. But sometimes I just didn’t know which way to direct him. So I began, again unplanned, to just shrug with both palms turned upwards when he looked to me in those situations. And now being an old pro, when he sees the shrug he responds by going back to seeking on his own right away. But I always think he’s just a little disappointed in me when he does that. Peter: I LOVE the shrug! I’m going to start using that myself. I usually say, when Willie can’t find a toy, “How would I know? You’re the dog.” Probably a good thing he doesn’t know what I said. Or maybe better that he can’t talk back? I’m wondering if I might have success using that ball/treat predator avoidance behavior to my terrier Rascal, who stalks, and catches lizards. Eats, then regurgitates later. On the carpet. I’ve had a similar experience to Peter, when I trained a GSP. A single blast on the whistle and she would look back to be directed left or right. Luckily, she loved the work enough that she didn’t quit searching and pointing, despite my never actually shooting the birds. But I know that “disappointed in me” response well. It’s how my current dog reacts if I get us temporarily lost in the woods! My very best dog in the world, Louie, was quite a ‘velcro dog’ when he first come to live with me. We eventually took him to a beginning agility class and his adherence to my side inhibited things like going thru the tunnel, etc. The instructor suggested we ‘bowl him out’ to go around an object some distance from us. Using an exaggerated bowling motion eventually became a signal to ‘go over there’ which we coupled with ‘Go around’… a tree, a rock, a pile of kelp, the corner of the house. What a useful gesture and command! If he saw me in the house from outside, I could tell or gesture him to ‘go around’ and he’d get to the door. Being a less than enthusiastic eater, if I had him ‘go around’ the loop from the kitchen to hall to living room, he was ready to eat when he returned to me. I think it gave him a lot of confidence that even if he went away from me, there was a definite return at the end. I loved that boy so much. Still do. I use pointing all the time. Often I use it to indicate where the dog needs to be in relationship to me. That paid some nice dividends once with Ranger. Our local pet supply store has a few events per year where, among other activities, they have some dog games that you can play for prizes. Your very modest entry fee supports one of the local rescues and the prizes are all things from the store, the better you do the bigger/better the prize. Ranger is a star at this, often doing things he’s never done before because he can follow where I point and do what I ask. At one of these events they decided it would be fun to pit Ranger against a Rally champion. Ranger had maybe 5 minutes of Rally training when he was with my son in 4-H so really has no idea. He beat the Rally champion at the game because the Rally dog kept looking for the clues that this was a Rally course or Rally training and not finding them. Ranger just went where I pointed for him to be and did what I asked. He’s used to being asked to do odd things in all sorts of environments. The prize we walked away with was a gift basket with about $50 worth of dog treats and toys. I use pointing with Finna as well, usually in the context of asking her to get a ball that’s rolled under a bush. One of my cherished memories with Finna is when she discovered I cannot see nearly as well in low light as she can and would be oblivious to a ball that was clearly visible to her. She likes to play ball where she rolls it down a little slope and I toss it back to her. She’d rolled it down but I didn’t see where it stopped and was walking around looking for it. Finna remained where she was at the top of the slope and pointed to the ball with her nose and I found it. That was a revelation for this product of an animal hording situation; the pointing gesture could work both ways! Not only could I give her information by pointing but she could do the same for me. If it had been a cartoon that moment would have shown fireworks going off over Finna’s head. Finna didn’t understand pointing when she first came to live with us but she picked it up quickly. The Great Catsby has been much slower to pick up on the idea that pointing is intended to convey information. Finna pointing with her nose is now one of my favorite stories ever. It makes me wonder how often dogs get information from others based on the direction of their nose. Of course, we know that ‘gaze’ provides a lot of important information to both people and dogs, and it’s hard to separate out nose versus eye direction. But I would give a lot to see the thought bubble over Finna’s head if she realized that she too could point something out. Thanks for the story, fascinating. I wonder how often dogs think they are ‘pointing’ something out to us and we miss it? Seems we had to hyper select for extremes in pointing (head and body lasered into an arrow) for us to figure it out! In agility pointing is huge and my dog knew exactly what pointing meant even when I wasn’t sure I was pointing in the right direction. Some trainers don’t like handlers to use pointing, but I found it very useful. Sam will follow my point probably because it generally involved a tasty morsel at the end of it. I use the point with the command ‘find it.’ He tests his attention as well as keeping his focus on me rather than whatever stimuli is close by. When I work with shelter dogs, I’ll usually declare “we’re going that way” and point, and it often seems to work. I wonder, though, if that has more to do with the fact that I’ve squared my hips and my vision in the direction I want us to go. I’m most successful, however, in getting dogs to move by wiggling my fingers in their peripheral (or not-so-peripheral) vision. I knew dogs were especially sensitive to motion so started experimenting with this and, sure enough, it usually works. Kira the Goldendoodle is a sweet charmer at 7, but she’s never caught on to pointing. She goes to her default behavior: I point, she sits. It always frustrates me to no end when there are studies on “dogs” that are done on a particular breed and then generalized to all of dogdom. It seems apparent that dogs that were intensely selected for this trait or that will not all behave the same as each other. A beagle bred to follow its nose with little input from his humans is not likely to respond the same as a working-line police dog bred to closely follow her person’s every move. One occasion of hiding on my little herding dogs was enough incentive to teach them to keep me within their line of sight while hiking off-leash in the woods. A beagle who panicked when it lost its people would be a poor rabbit dog indeed, and a pound of steak would not be enough to lure most of them off a scent. It stands to reason that the same differences hold true with following points, turning to people for help with solving problems vs solving them alone, and so on. And of course nurture plays a role as well. Jack, raised as a pet, learned to follow a point pretty quickly. Maddie, raised in a house but for the show ring, learned to follow the “bait” in a closed hand and so never really learned to follow a point but remained intensely focused on the hand itself. Same breed, closely related, different outcome based on early conditioning. I hope I am not hijacking the conversation, but I thought that close followers of this blog would want to know that we sent our sweet Maddie over the bridge last week. She had degenerative myelopathy, which is like ALS in people. 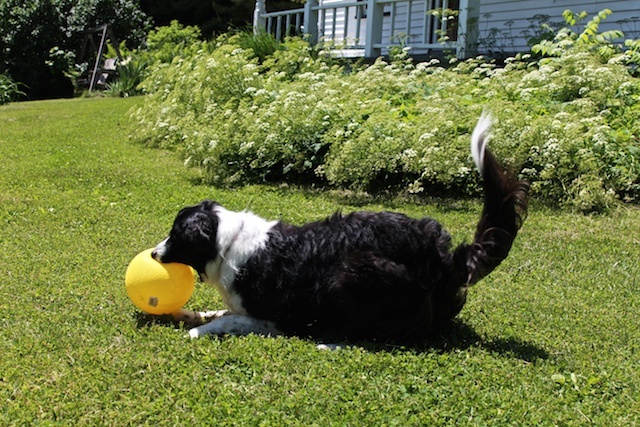 In dogs it always starts in the back and slowly moves forward. People may remember her picture, smiling in her cart. It had started moving into her front end several months ago and she was stumbling and falling in her little wheels. We wanted to spare her what was to come and made the difficult decision to send her on while she was still relatively happy. She was so excited when we were getting her in the car that last time— A road trip!!! — and it broke my heart. She was the happiest, bravest little dog and never lost that smile through all her trials. Run free, sweet princess. You are with the angels now. Our hearts are broken but we have some comfort in knowing she had a wonderful life, filled with nothing but love and adventure from start to finish. She went to the great hereafter thinking that people were nothing but good and kind and wise. I only wish we were all as brilliant as she thought we were. I couldn’t agree more with the importance of nature and nurture. Both our dogs are opposite sides of the same non-early-nurturing coin. Their genes influenced how they each were affected by their early experiences, but it’s clear that they would be very different dogs if they had more nurturing environments as youngsters. I point when I ask them to leave the room, I’ll say “out” and point to where I want them to go, and I use it to indicate the direction to go find the ball or the treat. I don’t point a lot, though. Olive points with her nose as she does a sideways dance backwards to show me that she’s ready for me to toss the ball. She looks like a canine Charlie Chaplin. I guess it’s really a whole-body point. Oh Beth, our hearts are with you. Thanks to you Maddie had a wonderful life, what a lucky, lucky dog she was. Just remember: Although it feels like a little bit of you died with Maddie, a little bit of Maddie will always live on in you. Here’s to her indefatigable spirit. If Maddie’s expression in the photo on this blog is any indication, she had a very, very good life. Thanks for giving that to her, Beth, and so sorry for what you’re going through. I can relate. What a lucky, lucky dog she was to have you! Beth, I am so sorry. Maddie was one of those dogs that everyone connected with, and she certainly had a brave spirit. Here’s the Catherine Young poem (if you didn’t see it before) (https://www.patriciamcconnell.com/theotherendoftheleash/things-to-do-after-your-dog-has-died). I love it, and I hope you do, too. It makes “the nothing less than a biological miracle,” visceral and true in the most honest way. My 12 year old Collie loves food and learned long ago that when I point at the floor, there is food there. So, she almost always follows my pointing gesture. I have always used some hand signals with verbal commands for simple behaviors like sit, down, stay, and come. Now that Tess is mostly deaf, the signals are very handy. Come is still the one Tess obeys when she feels like it. She looks at me in a way that says, “Just a minute, mom.” Then she slowly makes her way to me. Beth, just about all of us have experienced the sadness you now feel. You gave Maddie a wonderful life, and the good memories will remain with you forever. All of our dogs have been very attentive to our pointing gestures — made with hands, or feet. (Feet so useful for directing their attention to a Cheerio fallen on a light-colored floor….) When I first read about Hare and his research, my immediate reaction was “OF COURSE dogs pay attention to pointing gestures!” I was stunned to learn that chimps do not…………. Beth, I just wanted to send you my deepest sympathies. I lost my 16 year old a month ago and, even tho she lived a good long life and I should be grateful for that, I can still cry in an instant when I think about how much I miss her. Maddie was very lucky indeed to have you in her life. Run free, Maddie. Sympathies too then to HFR for the loss of her 16 year old. Sixteen years! Such a long life for a dog, and such a short time for us to have them. Thank you LisaW for thinking of Catherine Young’s poem. (https://www.patriciamcconnell.com/theotherendoftheleash/things-to-do-after-your-dog-has-died) I ran into Catherine, former trainer for my company, after having not seen her for years. Like many, she said she had something she’d like me to read. I didn’t think much of it, because I hear this so often, and so often… well, you know. I finally sat down several days after Catherine gave me her poem and had one of those moments when you stop moving and barely breathe and are so riveted in what you are looking at that all the rest of life seems to fall away. I will always be grateful to her for writing it, much less sharing it with us. Andy, thanks for telling us about your ‘finger wiggle’ cue. I’m interested: Does it turn their heads in the ‘right’ direction, or do you think that they have learned to follow the line and look farther away than your fingers? I’m don’t comment much but I’m so sorry about Maddie, Beth. What a sad, hard, and right decision. I’m glad I got to know about her. She filled our house with joy and her presence will always be felt. The poem made me cry, again. Here is another quiet little poem I found, by a poet I’d not heard of before. Not written for dogs but it seemed to fit. We have many trails running in all directions in our woods and they are a great playground for the dogs. When I get a new foster dog, I keep him/her on a leash until I am confident the dog knows where the house is and can be trusted off leash. I always point and say “This way” to indicate which direction I want to go. Our own dogs often stop at a ‘crossroad’ and turn around to look for my signal. It doesn’t take very long for the foster dog to catch on. Pointing makes a walk in the woods fun. Beth and HFR – I am so sorry for your losses. I can still picture carrying my first dog into the vet’s office after 15 year together, blubbering like a fool the whole time. Knowing you did the right thing does not make it much easier. Re beagles and steak, my old beagle-retriever mix would have had a simple solution: 1) Eat the steak; and then 2) Track down the rabbit. Done and done. Back on subject: On this morning’s walk with Red Dog, I spotted a squirrel running along the top of a fence and conducted an impromptu pointing test. When I said “squirrel,” Red Dog went on full alert. Yes, just like the movie. When I pointed at the squirrel, Red Dog looked at my finger. When I stared at the squirrel, Red Dog followed my gaze and spotted the squirrel. Much fun ensued. Disclaimer: No dogs or squirrels were harmed during this research. Conclusion: Red Dog either does not understand pointing, or perhaps more likely, she did not expect me to encourage critter-chasing (since I spend much of my time preventing her from chasing critters). More research needed – please send grant money. Beth and HFR, I’m so sorry. There is no pain quite like the loss of our dog hearts. Thank you for giving them such great lives. When I read about another neglected dog, it helps to remember owners who care so much. The pointing experiment with dogs was on a fascinating TV show ‘Dogs might Fly’ recently. Adam Miklosi designed the experiments to assess the dogs. Even in a small sample of dogs – mostly mutts – the variation in response to pointing was huge. They also used our other limbs – legs – to point as well as arms and also used head turns to see how the dogs responded. Generally, the dogs with herding and guardian breeds tended to respond to pointing. The terriers and hounds were too intent on the environment and tracking the ground! Beth – hugs to you and belly scratches to Jack. Your description of Maggie still expressing joy over a car ride despite her condition is heart breaking. I have so enjoyed getting to know Maddie over the years and she was such a lucky girl to have you and your family love her like you did. HFR – sorry to hear you lost your dog so recently too. 16 is a good age but even if they lived to 30 I would still be asking for a few more years. The pointing thing is funny because my two standard poodles look at me like I’m speaking cat if I try to point something out to them, like the location of their toy in the yard. But the older poodle is doing agility and I find it amazing the nuances of my body he pays attention to. The way I slightly turn a shoulder determines which direction he turns; he watches the direction of my feet and eyes, closed hand or open hand. He can see if I’m running in a forward position or straightening my posture as he goes over a jump. So many little things that I do with my body mean something to him and I didn’t teach him any of that. The difficult part of agility is what I have to learn, not the dog. It’s so easy to expect them to do something and get frustrated when they don’t do it and a lot harder to realize that you’ve just told them something completely different with your body. Beth, I’d like to join the chorus who are so glad to have known Maddie through this blog. I remember thinking when I lost my almost-18-year-old cat that now her sweet spirit and her energy belonged to the universe again. I think currently our universe needs Maddie. I swear I thought I posted this yesterday, but it’s not showing up so maybe I forgot to click on “post comment”. Sorry, if this is a repeat. Just wanted to say thank you for the kind thoughts. Trisha, that poem was wonderful. Especially the line about being curled up in the corner. We’ve all been there. The genetic versus environmental implications are SO important for the Destroy All Dangerous Dog debate. I’ve got in vicious online arguments about whether or not ex-fighting pit bulls should be rehomed. My own dogs – my springer spaniel responded to directional hand signals from a distance (an arm sweep towards the way I want her to go) with absolutely no training from when we started to let her off lead (we got her at a year old, so spent 2-3 weeks bonding with us first). It is possible that she had gundog training before we got her, but judging by the rest of her behaviour only if she was dumped at the pound for being a failed gundog! She learned ‘go over there’ in the house very easily too. My BCxspaniel we have had longer, and was hand shy and nervous when we got him (again around 1 year old on adoption). As I remember he picked up pointing (‘ ‘go over there’) very quickly once he became a little less nervous of us. We had a BeardiexLabrador when I was a teenager who picked up ‘retrieve THAT toy when I point to it’ on the first lesson, and I knew sod all about dog training at that age. So all really good at pointing, but all gundogs and gundog/shepherding mixes. PS, it’s hard to point without moving the rest of your body or looking with your eyes, I shall try to remember to try this and report back! I try to work my Australian shepherds on livestock (they were bred to work cattle, but mostly we train with goats or sheep). Around here trainers tend to use an outstretched arm (with or without stock stick in it) as a block. If the dog is out in front of me and I raise my left arm, it’s because I want him to move clockwise. I make it harder to do a go bye (counterclockwise) because he would have to move all the way around the extended left hand, and easier to go clockwise toward my unguarded right side. This wreaks havoc with my brain because I so want to point “Go out that way, you silly dog” instead of waving a stick “Don’t come this way.” I’m not certain if the dogs are confused or not. Epigenetics is such an exciting field! Habi and Obi are very attuned to gestures, but they’re clueless about following a pointing hand. Both are border collies, both came to us as adults from shelters so we know little of their history. We’ve been thinking about teaching them right and left signals; perhaps it’ll come if we tackle that. Habi is extremely good at explaining directions to us. She’ll nudge us out of a chair, then, with exaggerated glances over her shoulder, leads us to whatever she needs. She obviously thinks we’re a little obtuse. Both dogs understand a shrug as “Nope, I don’t know where it is either”, and will redouble their search efforts. We didn’t teach it; they just picked it up. Loved the story of Maggie’s double-take about fetching the lambs. And we sympathize with Will’s ball-biting tendencies. Obi has punctured two exercise balls (so far) in his Treibball enthusiasm. Beth, thank you for sharing Maddie with us over the years. Our sympathies to you and HFR on your losses. The Rabindranath Tagore poem is wonderful. I just started reading John Coppingers new book What Is A Dog? So far soooo good. I was wondering has Trish or any other person on this blog read it yet? If so, what do you think about his observations and findings? I found out, by using a laser pointer to ‘extend’ my gesture, that I was not pointing anywhere close to my target. I wonder if this might be a factor for others also. The context was the Utility Directed Jumping exercise, where the handler is approx 40 feet from the dog, & facing them squarely (if the dog has done a straight go-out & is sitting in the target area). Handler is at 6 o’clock, dog at 12, jumps at 3 & 9. With the laser pointer I found I was pointing anywhere from 130 to 430 at the 3 jump, for example, & when my aim varied, so did my dogs’ return–they might go around the jump to the outside, jump, or pass it on the inside. I also did agility with them, where any of those might have been the correct choice, but where they also had cues from the direction of my shoulders & feet that were lacking in the Obedience ring. So there’s another variable. Along with selective breeding, whether or not the dog has a history of being fed from a hand (if they have, even a couple of times, they’ve already been ‘taught’ to stare at the hand, not at where it’s pointing), & other inadvertent body cues from the handler. I think it would be VERY difficult to remove these from the experiment, even more so when using mixed-breed shelter dogs of unknown history. Doesn’t mean researchers shouldn’t try. Have at it, folks, & keep me posted. And Beth, so sorry about Maddie. @Ron Bevacqua: I read Lorna and Ray Coppinger’s book and found it fascinating. The implications for rescues, at least philosophically, are mind-boggling. Thank you for sharing with me your thoughts. I just can’t wait to have Trish do a blog on the book, too. Perhaps, she will say the book is a must read this summer. This will keep me glued to her blog waiting to get her perceptive and her scientific point of view. Thank you as always for your wonderful pieces. I always enjoy reading them. With my dogs, I tend more toward gestures and use less verbal commands. Even with the usual “Sit,” “Down,” etc. We recently got a new dog, and I am working on teaching him signs. I think it keeps things interesting for all of us.